“Snow pelts my face,” the brass lead holder scribbled on the folded journal page. “Now and again, icy flakes sneak behind my spectacles and sting my eyes. I pulled the wool blanket’s folds up around my cheeks. In front of me, a dead white ash leans south against a pitiful specimen of a wild cherry. Half of the ash’s branches are gone, the rest hang from the trunk’s underside. I slipped the brass lead holder and folded paper into the buckskin envelope, wrapped the thong around the envelope and tucked it in the top of my right leggin. I buried my fingers in the blanket’s folds in hopes of warming them enough to continue writing. I sat cross-legged in a nest cleared in the snow, in a hollow spot between two maple roots. The snow squall grew stronger. Only my eyes moved from side to side as I watched the last trail in the bottoms, the one devoid of white-tailed deer. Twenty or so minutes later the scribbling resumed. “A strange compulsion drives me. I wandered beyond the second island, deep into the Raisin’s tangled abyss. I ventured out for a taste of the hardship of 1796, for the gratification of knowing that I can survive in the desolation that is December along the River Raisin, and to practice the old ways. 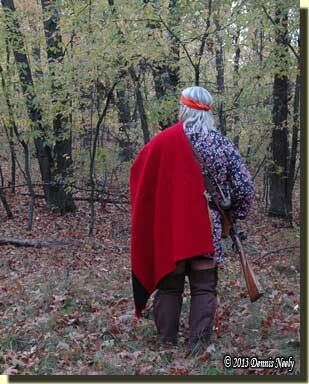 Woven in the midst of conversations among traditional black powder hunters or living historians of late, seems to be the standard response: “struggling a bit,” or a variation thereof. This past weekend at the Kalamazoo Living History Show®, many conversations touched on life’s constant pulling and relentless tugging, on uncompromising schedules and on the resulting lack of available time to devote to this glorious pastime. 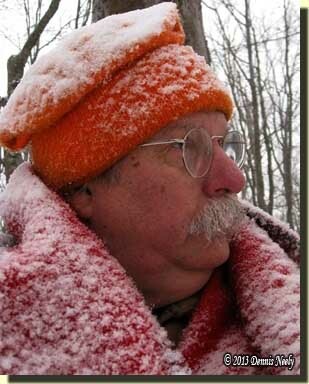 With winter still hanging on, at least here in Michigan, many traditional woodsmen are looking forward to the spring turkey season, while those who are strictly living historians share the same anticipation for the first warm-weather re-enactment of the year. It is, after all, normal for all of us to be looking forward, especially when afflicted with a severe case of cabin fever. Whether we realize it or not, struggles are an inherent element of wandering down the path to yesteryear. They are always there, rearing up in varying degrees of urgency, and sometimes, at the most inopportune times. On other occasions, traditional hunters take them in stride without a second thought. I suspect the difference is the stress level in our daily, 21st-century lives. For myself, I find I am behind on outfitting my new persona, that of a returned native captive who just can’t fit in with settlement life. A cut-out shot pouch, fashioned in the Odawa style, has been sitting on the corner of my workbench since last fall’s waterfowl season. A split pouch still needs dyed deer hair added to the dangling tin cones. Pieces for a coarse-linen outer shirt are neatly folded on the corner of the bed in the guest room, and have been since before Christmas. And at Kalamazoo, I bought hand-dyed silk ribbon to bind the edges of the breechclout I have been using for almost a year, plus some more to finish off the flaps on a pair of blue wool leggins that are lurking somewhere in a folded yard of fabric. Like others, my frustration level is running high, fueled by guilt spawned from simply not having enough spare time to devote to the hobby right now. And there is no doubt in my mind that not making it into the woods since early January is at the root of my displeasure. Life—and winter—gets in the way, as we all say. I have been here before, and with the good Lord willing, I will be here again. The key to dealing with such frustrations for traditional woodsmen is to step back, take a deep, cleansing breath and count the steps forward on the path—to seek enjoyment from the little victories and successes. They are many, and often they go unnoticed, slipping by like a raspberry switch brushing against a buckskin leggin. As if an answer to a prayer, this morning I happened upon the journal page written last December. I have referenced that tranquil snow squall many times, because for me that simple pursuit represents the final exam for last season’s traditional hunts. A number of struggles that surrounded my new persona found solution in those four solitary hours of suffering. Indeed, there is more to tell, more revelations to share, but for now my focus is on the scribblings of the second page. I have felt the kinship with long forgotten souls before, pristine moments, as I call them, but never as the new historical me. This was a first for the woodsman that grew up among the Ojibwe. There was no mysticism or magic involved, rather, a nurtured mindset allowed a cold and weary time traveler to return to the River Raisin that once was. And is this not what we all seek? Are we not accepting the price of wilderness living, no matter how dear? Are we not taking the harder road, a road that we believe was once traveled by our own personal hunter heroes? Is this not the essence of the life we so dearly crave? Step back, take a deep, cleansing breath and count the steps forward on the path…be safe, and may God bless you. 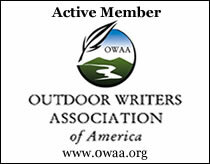 This entry was posted in Deer Hunts, Living History and tagged Dennis Neely, historical trekking, Mountain Man, Native captive, North West trade gun, Northwest trade gun, trade gun, traditional black powder, traditional black powder hunting, traditional blackpowder, traditional blackpowder hunting, Traditional Woodsman. Bookmark the permalink.